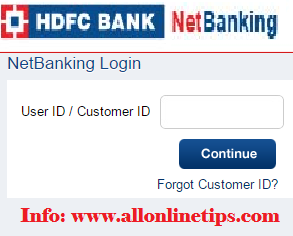 Procedure to change registered mobile number in HDFC bank credit card through net banking: HDFC bank provides makes its service of providing of credit card facility to its customers very easily by using their net banking account. The below is the procedure how to change registered mobile number in hdfc credit card online through online net banking. HDFC bank limited is an Indian banking and financial services company head quarter at Mumbai, Maharashtra. It was established in the year 1994. HDFC bank provides a number of products and services which includes whole sale banking, retail banking, treasury, auto loans, two wheeler loans, personnel loans, and loans against property and hdfc platinum/ Titanium/ moneyback credit card. Full details about how to change registered mobile number in hdfc credit card online full details are provided below. By using the HDFC Bank Credit card will have many benefits than the usage of HDFC bank debit card. If we use the HDFC Bank credit cards responsibly as per the bank norms there much more benefits. For the usage of credit card it is necessary to provide mobile number for getting the account balance and transaction details and other details as well. If you want change or register the mobile number with your credit card. The following is the procedure to follow for changing the mobile number of the Hdfc bank credit card through net banking account. Open the net banking website of the HDFC bank. https://netbanking.hdfcbank.com/netbanking/. After opening Website POPUP Login with your login credentials. Thenclick on instaquery registration in the top right corner and select de-registration from the menu. Then list will be displayed on the screen, select the number which you want to de-register and then click on continue and submit the confirm button. De-registration will be successfully completed and then you have to register for new number. Then click on the select subscribe from the left side menu. Choose your account number from the list of all the linked accounts to the customer identification number. Fill with your 10 digit mobile number with the country code (+91 India Code). Then click on check box and then press confirm button. After that your request for change of the registered mobile number is successfully completed.